The Knights of Columbus is the world's largest Catholic fraternal society. 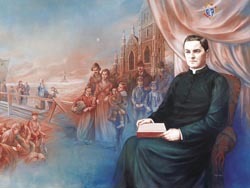 Founded in 1882 by Venerable Father Michael J. McGivney at Saint Mary's church in New Haven, Connecticut, it was officially chartered by the state legislature on March 29 of that year, which is now recognized Order wide as Founders Day yearly. During the course of the next 130 years, the Order spread to other sub-ordinate local councils whose membership practice the three main principles of the Knights of Columbus Order, Charity, Unity and Fraternity. The Msgr. Thomas Mooney Council 13228 was chartered November 3, 2002 at St. Ambrose Church in Bridgeport, CT. The Council took it's name from the founding pastor of the parish, Msgr. Thomas Mooney. When the parish closed, the council was welcomed to our current location at Our Lady of Grace parish in Stratford, CT. by the pastor of the church at that time, SK Msgr. Schultz. Msgr. Schultz passed away October 13, 2013. Our current pastor and Chaplain is SK Msgr. Ryan, who is an active member attending our meetings regularly. Members are Ushers, Extraordinary Ministers, Lectors, CCD Instructors, serve on parish committees and more. We're fathers, brothers, sons, uncles and friends trying to strengthen our families, parish and community. We strongly support the parish Faith Formation programs, and have an ongoing Food For Families program supporting the Daughters of Charity food bank as well as assisting Sterling House Girl Scout troop's food program. We've hosted the parish's annual Church Picnic since moving into Our Lady of Grace as well as Pasta "Knights", Country Breakfasts as well as annual Breakfasts with Santa and Easter Bunny. Lead a parish rosary when a 5th Sunday falls in any month. Provide an Annual Scholarship to young men of the parish. In fact, wherever you see parish activity, chances are there is a knight presence. You see us all the time, although you may not know we are members of the knights. We continue to look for ways to grow our support of the parish and by extension, our community. We have a very active membership and are always looking for men who would like to work "shoulder to shoulder" with us so we may continue to strengthen these programs and do more. Membership is open to all practical Catholic men 18 years old or older. If you would like to more information on the Knights of Columbus, send us a note using our contact page or you may visit the Knights of Columbus Supreme Council website. Meetings are held monthly on the 2nd Monday and begin at 7:30 p.m.
An interesting interview concerning Christopher Columbus, the namesake of the Order of The Knights of Columbus. In the face of a new barrage of attacks against Christopher Columbus, it's important to be aware of true history of Columbus. The Origins and Traditions of Columbus Day,.. a must read for those who would understand more about Columbus. The Work of Christopher Columbus,.. "Our Lady herself put the Divine seal of approval on the work that had begun with Columbus's expedition of 1492, appearing to Juan Diego on December 9, 1531, at Tepeyac, Mexico, resulting in the rapid conversion of over nine million indigenous people to the true Faith following within ten years the conquest of the barbaric Aztec system of human sacrifice. Indeed, a thriving Catholic culture emerged in Central and South America within a very short period of time. Saints, both from abroad and those born in the Americas, emerged to propagate the true Faith". 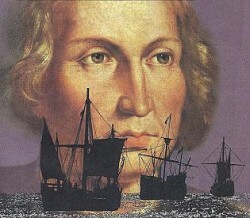 The Catholic Spirit of Christopher Columbus ,.. very well written. The Crimes of Christopher Columbus ,... helps answer the real reasons behind many of those who denigrate our Patron. Must read to defend and reply to those who wish to remove statues, plaques, Columbus Day - and truth. ﻿L﻿earn more about our founder, Fr. Michael J. McGiveny, and how his case for canonization is moving forward by visiting THE FATHER MCGIVNEY GUILD homepage. Msgr. Thomas Mooney Council 13228 members concretely show support by closing all council meetings by reciting in unity the Father McGiveny Prayer for Canonization led by our Chaplain Msgr. Ryan.